Providing you the best range of gel / ointment /cream manufacturing plant and syrup manufacturing plant with effective & timely delivery. Sterinox make Ointment Manufacturing Plant ideal for manufacturing High Viscous Product like Ointment, Cream, Lotions, Tooth Paste & other emulsions & homogenization. 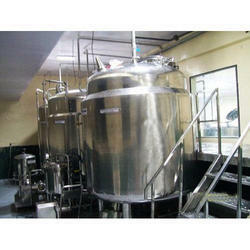 The plant is designed as per the CGMP and FDA guidelines. Ointment Cream Manufacturing Plant is designed to handle processes right from transferring of raw material to the delivery of finished products. The plant offers efficient homogenization with heating & cooling with support of accurate temperature control. Central control panel for controlling all the processes of the plant. Ø The plant is designed as per the CGMP and FDA guidelines. Ø Completely closed loop system as per GMP requirements. Ø Integrated system makes it easy to operate and clean. Ø A bottom entry homogenizer provided at an angle for proper homogenizing of the product. Ø A variable frequency drive (VFD) for both the anchor agitator. Ø The agitator is provided with suitable PTFE scrappers to cover the entire internal surface of the vessel. Ø Process control for individual items at each level of production. Ø The gaskets are food grade silicon, conforming to GMP guidelines. Ø Load cells with control unit for the main manufacturing vessel. Ø PLC based panel with touch screen HMI and menu options for the panel. Ø Contra mixer with two motors for preparation of foaming products like toothpaste, etc. Ø Perforated anchor agitator for difficult to mix products. 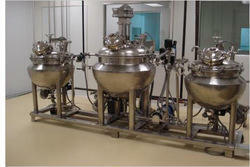 Ø Completely closed pre-preparation vessel for manufacture of sterile preparations. Our company is engaged in manufacturing and supplying premium quality Syrup Manufacturing Plant. Here sugar syrup is prepared using high speed stirrer and electrical/steam heating at required temperature. The highly efficient transfer pump discharges the final product to the storage vessel through zero hold up filter press.